The prestigious American Institute of Architects (AIA) has just approved the nomination of Automatic Systems as an approved educational provider for its Continuing Education System program. 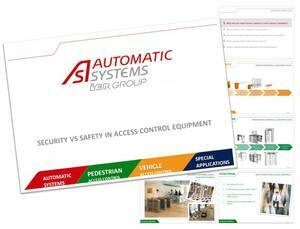 The first part of the Automatic Systems training program, “Security vs. Safety in Access Control Equipment,” is an introduction to controlling pedestrian and vehicle access using security equipment and user protection principles. The course is aimed at architects, engineers, and designers interested in working safety features into the interior and exterior designs of corporate and government buildings, industrial buildings, sensitive sites, and leisure complexes, among others. To sign up, visit www.aia.org/education and look for Automatic Systems in the database. We would be delighted to provide you with more details on content, dates, and training credits.